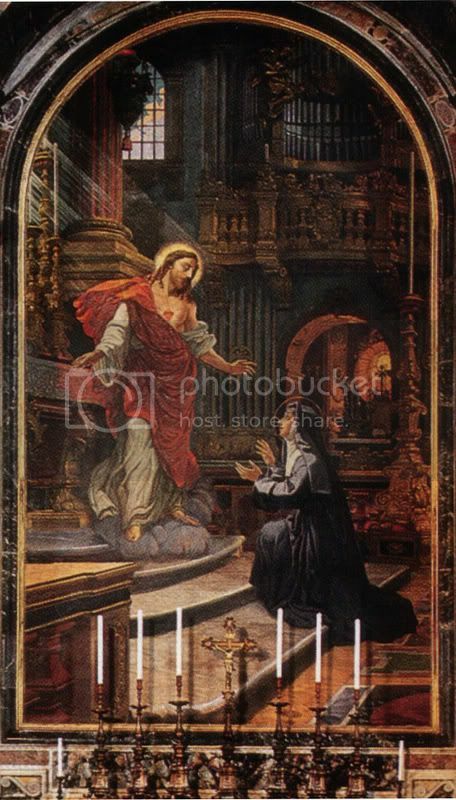 No account of the devotion to the Sacred Heart of our Lord can be complete without reference to the revelations granted to Saint Margaret Mary Alacoque, a Visitation nun of the 1670s passionately devoted to the Blessed Sacrament and the Rosary. 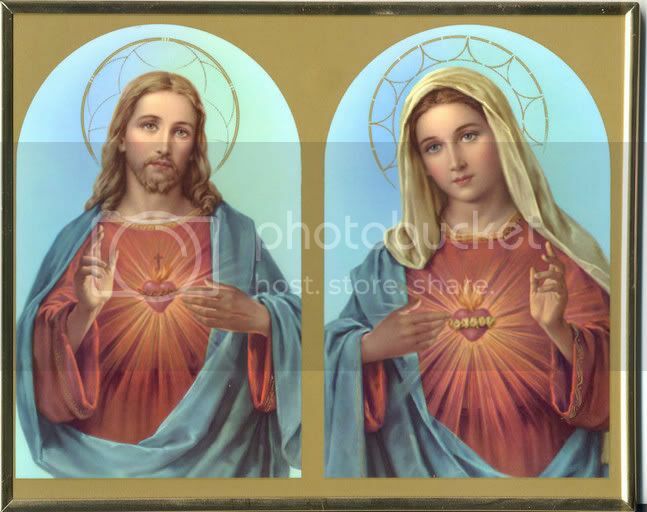 Yes, Saint John Eudes was an early contemporary of hers, and wrote wonderfully about both the Sacred and Immaculate Hearts. 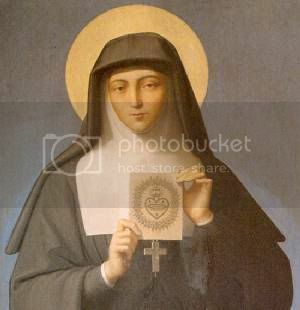 But it was the revelations to St. Margaret Mary that catapulted devotion to the Sacred Heart from one among many wonderful, valid devotions to THE Catholic devotion par excellence. The Monks of Adoration, prominently featured in the links column to the right, have put together this excellent biography of St. Margaret Mary, and history of the revelations about the Sacred Heart our Lord made to her. Here is another short biography of St. Margaret Mary. 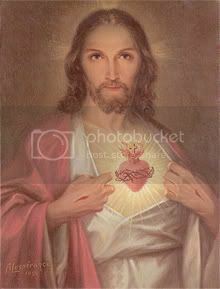 The Sacred Heart of Christ is an inexhaustible fountain and Its sole desire is to pour Itself out into the hearts of the humble so as to free them and prepare them to lead lives according to His good pleasure. From this Divine Heart three streams flow endlessly. The first is the stream of mercy for sinners; It pours into their hearts sentiments of contrition and repentance. The second is the stream of charity Which helps all in need and especially aids those seeking perfection in order to find the means of surmounting their difficulties. From the third stream flow love and light for the benefit of his friends who have attained perfection; these He wishes to unit to Himself so that they may share His knowledge and commandments and, in their individual ways, devote themselves wholly to advancing His glory. This Divine Heart is an abyss filled with all blessings, and into it the poor should submerge all their needs. It is an abyss of joy in which all of us can immerse our sorrows. It is an abyss of lowliness to counteract our foolishness, an abyss of mercy for the wretched, an abyss of love to meet our every need. Are you making no progress in prayer? Then you need only offer God the prayers which the Savior has poured out for us in the sacrament of the altar. Offer God His fervent love in reparation for your sluggishness. In the course of every activity pray as follows: "My God, I do this or I endure that in the Heart of Thy Son and according to His holy counsels. I offer it to Thee in reparation for anything blameworthy or imperfect in my actions." Continue to do this in every circumstance of life. But above all preserve peace of heart. This is more valuable than any treasure. In order to preserve it there is nothing more useful than renouncing your own will and substituting for it the will of the divine heart. In this way his will can carry out for us whatever contributes to his glory, and we will be happy to be his subjects and to trust entirely in him. "BEHOLD THIS HEART, WHICH HAS LOVED MEN SO MUCH, THAT IT HAS SPARED NOTHING, EVEN TO EXHAUSTING AND CONSUMING ITSELF, IN ORDER TO TESTIFY TO THEM ITS LOVE AND IN RETURN I RECEIVE FROM THE GREATER NUMBER NOTHING BUT INGRATITUDE BY REASON OF THEIR IRREVERENCE AND SACRILEGES AND BY THE COLDNESS AND CONTEMPT WHICH THEY SHOW ME IN THIS SACRAMENT OF LOVE. BUT WHAT I FEEL THE MOST KEENLY IS THAT IT IS HEARTS WHICH ARE CONSECRATED TO ME THAT TREAT ME LIKE THIS. THEREFORE, I ASK OF YOU THAT THE FRIDAY AFTER THE OCTAVE OF CORPUS CHRISTI BE SET APART FOR A SPECIAL FEAST TO HONOR MY HEART, BY RECEIVING HOLY COMMUNION ON THAT DAY AND MAKING REPARATION TO IT BY A SOLEMN ACT IN ORDER TO MAKE AMENDS FOR THE INDIGNITIES WHICH IT HAS RECEIVED DURING THE TIME IT HAS BEEN EXPOSED ON THE ALTARS. I PROMISE YOU THAT MY HEART SHALL EXPAND ITSELF TO SHED IN ABUNDANCE THE INFLUENCE OF ITS DIVINE LOVE UPON THOSE WHO SHALL LIKEWISE HONOR IT AND CAUSE IT TO BE HONORED."